Origin stories can be tedious. Not in the case of Netflix's sultry siren drama, "Tidelands." The mermaid-tinged series brings a sense of real-life conflict to its story's supernatural mystique. Set in Australia, the story follows two very different women as their paths eventually converge amidst a sea of turmoil both old and new. There is Cal (Charlotte Best), whose recent release from prison brings her home. Then there is Adrielle (Elsa Pataky), the ethereal "Queen" of the Tidelanders, a group of people linked by their heritage as the children of sailors and sirens. When the season begins, Adrielle is in search of something, and nothing and no one will stand in her way. Ruthless pursuits aside, this little town is teeming with eventful activity both supernatural and natural. Cal's brother Augie (Aaron Jakubenko) is running the "family business" as secrets permeate their past and present. Their father's death a life-altering tragedy that shapes a great deal of what happens. Settling into a world, she was away from and for mysterious reasons, gives viewers a chance to pause regarding Cal. She does not get presented as a straightforward heroine, and that gives the audience time to process her more objectively. The same applies to most of the series' characters as viewer instinct is given prominence over narrative foreshadowing. Once more is learned, the question of heroes and villains becomes harder to identify clearly. Therein lies a lot of the intrigue surrounding the series. "Tidelands" is a genre series with a mature edge. It pushes past the formulaic nature of its inherent design with a dedication that carries the mark of a post-"Game of Thrones" road map. Shocking deaths come without warning, and the show pulses with an "anyone can go" atmosphere, which means danger lurks around every scene. In that vein, "Tidelands" is an adult series for an adult audience. It is provocative and dark while balancing that out with a strong sense of sultry fun, and it makes no apologies for the latter either. Should a second season arise, it will hopefully not back down from this refreshing aspect, as so many shows have done in their sophomore seasons. As Cal begins to battle the two worlds she is caught between, all the while trying to find her place within them, "Tidelands" carves out an intriguing origin story for its lead. In showcasing the familial side of its drama, Cal and her brother Augie's relationship vests "Tidelands" with another unique facet – a functional sibling relationship. Their terrific brother/sister bond is tested and what emerges is a welcome reprieve from the norm. "Tidelands" has an enormously talented ensemble. As the enigmatic Adrielle, Elisa Pataky gives a robust and spectacular performance that sharpens the show's edge. As the series' heroine, Charlotte Best gives an impressive portrayal of the angsty Cal. Aaron Jakubenko's endearing turn as Cal's brother, Augie, is another major asset the show leverages considerably. Jakubenko portrays Augie as a good guy at his core, who carries a lot of roguish baggage along with him. That is far from believable on paper. However, Jakubenko sells it with his multi-dimensional performance. As the series' most obvious good character, Mattias Inwood brings unvarnished sincerity to the role of Cal's former sweetheart, Corey. Now a cop, Corey tries his best to sort out his feelings for Cal, despite her criminal record. Inwood portrays what television as a whole is largely missing – a good guy. That is not as easy as it sounds to get right and when it happens, it elevates things considerably. Hence, "Tidelands" catches a major wave. The first season breezes by with eight equally captivating episodes, wherein there is no filler to be found. That is a rarity. The story moves quickly, while focusing on developing what matters most – its characters. In its freshman season, "Tidelands" demonstrates a strong sense of self, which it uses to reach exhilarating heights. Not since "Smallville" has a superpowered series generated such excitement. As one of 2018's best shows, hopefully, there will be more of the series to dive into in the future. 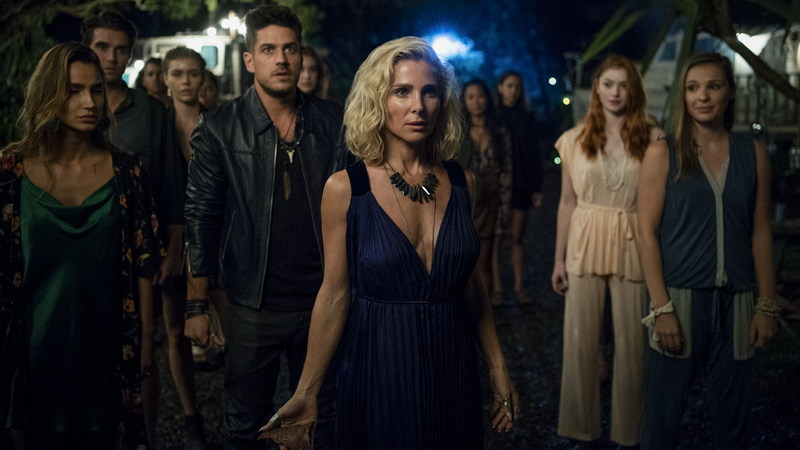 The first season of "Tidelands" is currently streaming on Netflix.